How will the Greek default affect Russia? The Greek government has missed a crucial debt payment to the International Monetary Fund (IMF), which means that a technical default could be announced following the referendum on July 5. The Russian economy is largely insulated from the potential turmoil that could occur in the event of a default. Moreover, Russian analysts believe that if Greece leaves the eurozone, this would open new opportunities for trade and economic relations with Athens. On June 30 the Greek government missed its 1.6-billion-euro tranche to the IMF. The announcement was made by Greek Finance Minister Yanis Varoufakis, reports Agence France-Presse. This means that Greece is essentially already in default. The Russian stock exchange did not react to the news. "Greece's default is an expected event, which is why the investors' reaction will be restrained but negative," says Anna Kokoreva, an analyst at Alpari foreign exchange brokerage. "We are not expecting the collapse of the euro and the capital markets, but a slight decrease is inevitable. Market indexes may decline by 2-3 percent." The dollar is also expected to strengthen as a result. "The general volatility of the Russian currency and securities will increase," remarks Elizabeta Belugina, head of the analytical department at FSB Markets, Inc. "But considering that the weakening of the ruble has a positive effect on the Russian economy, there shouldn't be any serious negative consequences of the Greek default." Experts believe that the Greek default could temporarily result in an outflow of capital from Russia. "Investors will take fewer risks and subsequently there will be a greater demand for more reliable, though less profitable assets," explains Kokoreva. Our economy now is not characterized by a high dependence on the inflow of capital, since the markets have been closed for a year," says Egor Susin, chief expert at Gazprombank. "Therefore, we shouldn't expect much pressure and an active outflow of capital." Analysts note that the process of default will be lengthy. 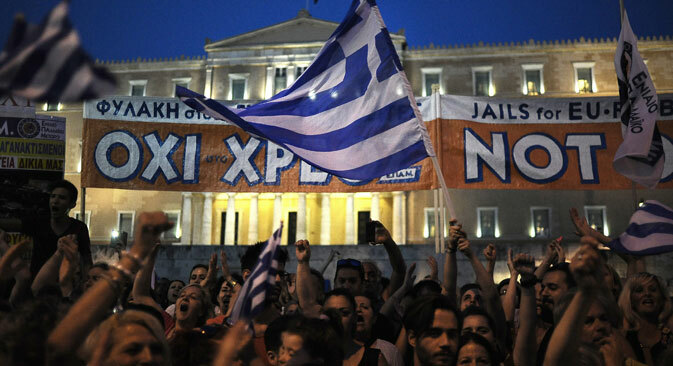 On July 5 Greece will hold a referendum on the creditors' demands. If most of the points of the reforms are approved, then this will remove the issue of default for some time. What is more important is whether or not Greece will leave the eurozone. Analysts at S&P say the “Grexit,” as this specific scenario is often referred to informally, has a 50-percent chance of coming to fruition. "If Greece leaves the eurozone, it will facilitate trade relations between Greece and Russia," says Kokoreva. "The country's new currency will be weak and its goods cheap. And the reduction of the country's dependence on external creditors can have a positive influence on its foreign policy with Russia." "This could even accelerate the Turkish Stream [gas pipeline], since after leaving the eurozone Greece will be more interested in cooperating with other countries," explains Susin. "However, we cannot say yet that Greece is doomed to leave the eurozone." Susin remarks that it is doubtful that the EU will allow Greece to leave the eurozone, since this could have unforeseen consequences. The volume of Greece's financial system is over 1 trillion euros. Moreover, the default could place Europe back into a state of recession and this would directly affect its trade and economic relations with Russia, which is one of the EU's main exporters and importers.